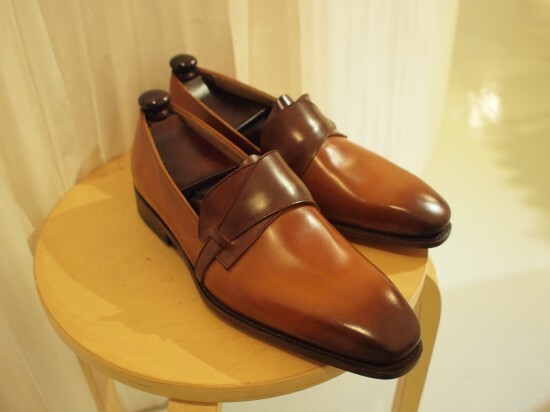 You may remember a recent post at Put This On about Singaporean shoemaker Edwin Neo’s Ed Et Al brand. I was so excited by the prospect of relatively affordable custom shoes that I immediately got in touch with Edwin and we got started working on a pair. The order was finalized this week and here a little bit about the process. While there is a wealth of made-to-measure tailoring, there are relatively few custom made, non-bespoke shoes on the market. A few top of the line brands, like Gaziano & Girling, Edward Green, and Alfred Sargent will do custom orders, but really nothing sub-$1000. Enter Edwin Neo. Ed Et Al offers custom shoes starting at just under $500 USD, and offers a wealth of options and knowledge for that price. 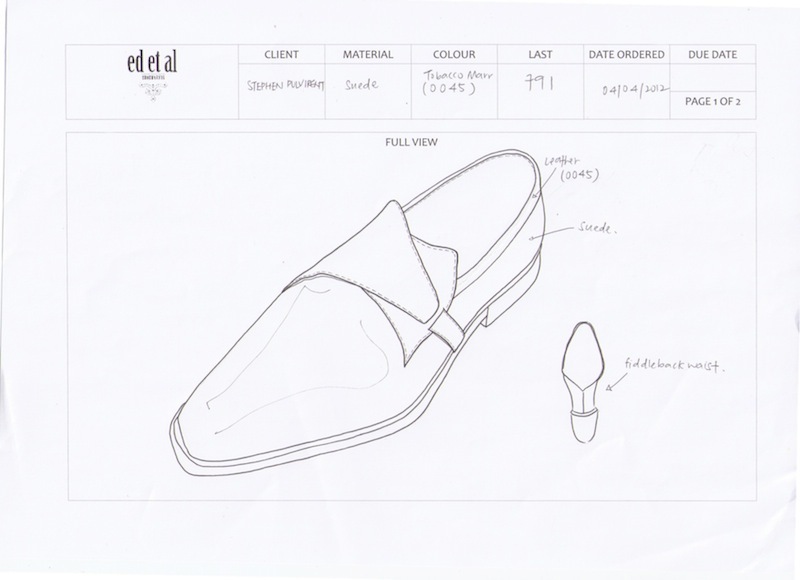 You choose an existing last, the correct size/width (which Edwin verifies by having you send him tracings of your feet), and then design the shoe along with Edwin and his team. I really liked the general look of a butterfly loafer Ed Et Al did as part of a capsule collection for Courvoisier, but wanted to put my own touches on the basic shape. Instead of a burnished leather upper, I decided to go for a mid-brown suede, with just a hint of tonal leather trim around the opening. We decided to keep the chiseled toe and add a fiddleback waist to augment the sleek look. After discussing all these details, sending in my foot tracings, and showing Edwin and Candy (the designer) a few images of shoes in the approximate color range, Candy sent me back a sketch of the shoe along with a handful color swatches to choose from. Since we’re doing all of this at a distance, I found these two steps really helpful. It’s a bit more work for them, but it ensures that I end up with exactly what I want, which is appreciated. You’ll notice on the sketch that the color was originally something different, but after seeing the swatches I decided to go a shade darker – much better to know this now than after the shoes are finished. We’ve settled on the Snuff Repello color and I’ve ok-ed the sketch, so now it’s just a waiting game for me while the craftsmen in Singapore get to work. This is fantastic news, I have loads of designs in mind. Do you know if their website is down, or if they only go through facebook? Their website does appear to be down right now. I’m sure it will be up and running again soon though. I am new to your web site and find it very interesting and informative. You have a style which has a comfortable basic approach without making one feel the need to be a millionair to purchase and enjoy fine clothes. All credit to you. Thank you for your kind words and I am glad you enjoy Simply Refined. I am in the United States and doing all this from a distance. The whole team over there speaks perfect English (so language isn’t an issue), and if you communicate sizing in UK figures I am sure Edwin can accommodate that. Even if you sent them a custom last, I think doing bespoke would be impossible without fittings, but custom should be no problem. My shoes should be ready in about two months and I’ll be reporting back here with an update, so I guess we’ll see then how well it works.